Lucid have addressed this incompatibility issue for the Lucid Matrix keys which will now load in Chrome and other browsers as an independent Java application. The jnlp file will download and the file will need to be accepted and run. The html version can still be opened in Safari and Firefox and is the recommended version for these browsers. Users can choose between three different key formats depending on their personal preference. Although Lucid Phoenix keys are interactive keys they are still dichotomous and a choice needs to be made at each key couplet to continue. Lucid matrix keys, on the other hand, use a different approach where relevant states from multiple character features can be selected independently until identification is achieved. For more information concerning Lucid keys visit www.lucidcentral.org. Erasmus J.C., van Noort, S., Jousselin E.,& Greeff, J.M. 2007. 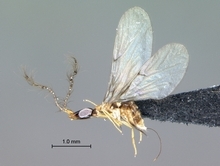 Molecular phylogeny of fig wasp pollinators (Agaonidae; Hymenoptera) in Ficus section Galoglychia. Zoologica Scripta 36: 61-78.
van Noort, S. & van Harten, A. 2006. Fig wasp (Hymenoptera: Chalcidoidea: Agaonidae, Pteromalidae) species richness of Yemen. Fauna of Arabia 22: 449-472. Photographs © Fernando Farache (FFCLRP-USP, Ribeirão Preto).